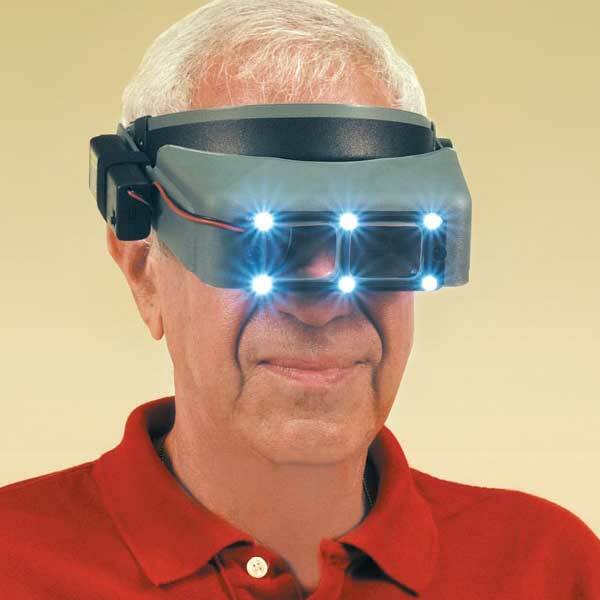 The Quasar Lighting System is designed specifically for use with the Optivisor binocular magnifier (available separately). Employing the latest in LED technology, Quasar lighting surrounds each lens with ultra-bright beams of white light that reduce shadows and increase visibility...especially good for viewing in holes and deep cavities. And the super-efficient LED's require little power...so the batteries can last up to 96 hours. Includes two Energizer® AA batteries, mounting strap, mounting pins and battery compartment. Works with #18110 optional attachment loupe sold separately. Installs in less than a minute. This is one of those devices that fits a need, perfectly, sometimes. Of the six LEDs, the bottom center one has never worked. After about 10-15 hours, the on off switch because VERY "positional", if I didn't think I had enough light, all I had to do was touch the switch, and the amount of light would change. <br>Truth be told, this is the second one I've owned. The first one died when it fell, ripping the wires out of the LED array. That one's switch worked perfectly. I highly recommend the unit, but wish the wires were long enough to wear it on that BACK of the head, where the weight isn't so much of an issue. After a couple hours, the weight on the right side becomes distracting. <br> Overall, bright, with new batteries, easy to install, simple directions, only down side is what I suspect are wiring inconsistencies.